We’d left the belt in Part 1 with the basic shapes and basic cover ready. 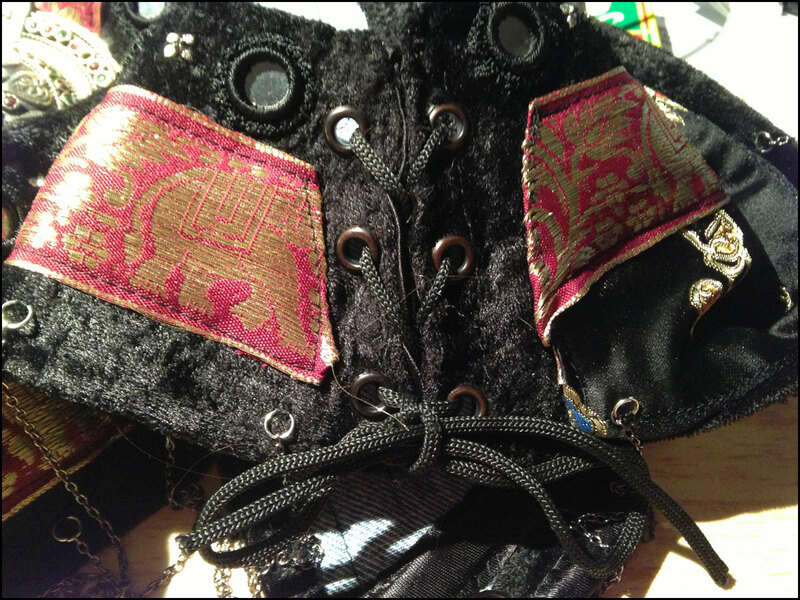 What you need to do next is, basically, to attach the fabric, add boning if needed, add lacing grommets if needed, add decoration. Simple, right? Once you’ve got your basic sturdy fabric shape and your base fashion fabric shape, overlap both, with the fashion fabric facing OUT and the study fabric’s inside facing towards you. Grab the extra edge you left all around, and start pinning. Depending on the fabric you’re using and the shapes you picked, you might need to clip some of it to get a better, neater fold. Be careful and make sure that the fashion fabric is not bunching or altering the shape of your sturdy fabric. Machine sew it all around, making sure that the internal edges are neat and there’s no bunching or pieces left without attachment. 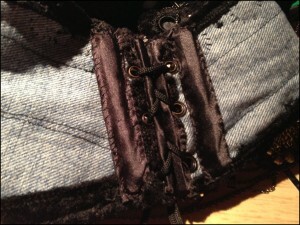 Wrap around your hips to make sure there is enough fabric, and there is no overlapping unless desired. If there’s not enough fabric, and for some reason the belt is a touch too short, consider using laces to make up for this. If there is a *significant* difference, you might be able to make up for this by adding two side panels, but for this to work you would be looking at least at 8″ difference or more, which would signal that there has been something fundamentally wrong in your process. Otherwise, you might have to review your numbers and cutting, because obviously there are issues, and you will have to start all over again. Sorry, go back to square one, and hopefully it will be better next time. if you are adding anything like a sari ribbon or any other flat decoration that requires machine sewing, now is the time to add it. 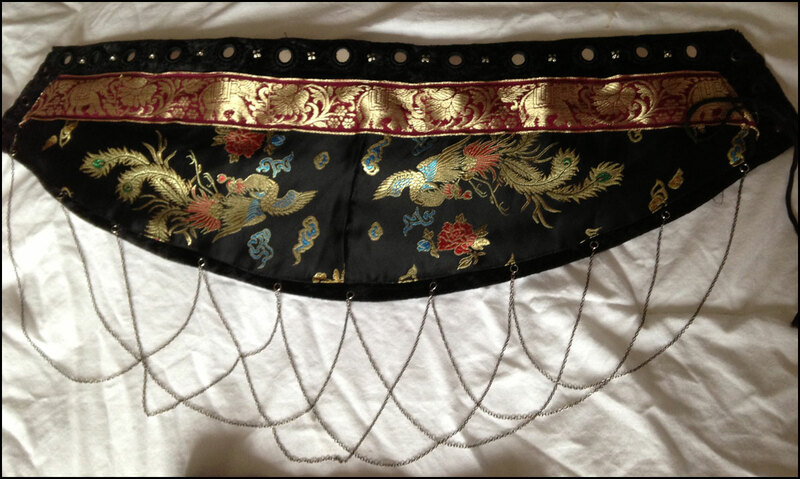 With mine, I realised that the bigger back would need something more and I would need some extra fabric decoration, so I cut two pieces of Chinese brocade to have two phoenixes (see finished photo). If you’re going to use lacing and/or need boning, now is the time to add it, just make sure that you’ve done all the other machine sewing needed first (otherwise you might accidentally sew through the channels). 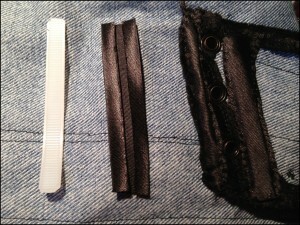 Cut your cable ties a bit shorter than the height of your belt, and cut the bias tape a bit longer. 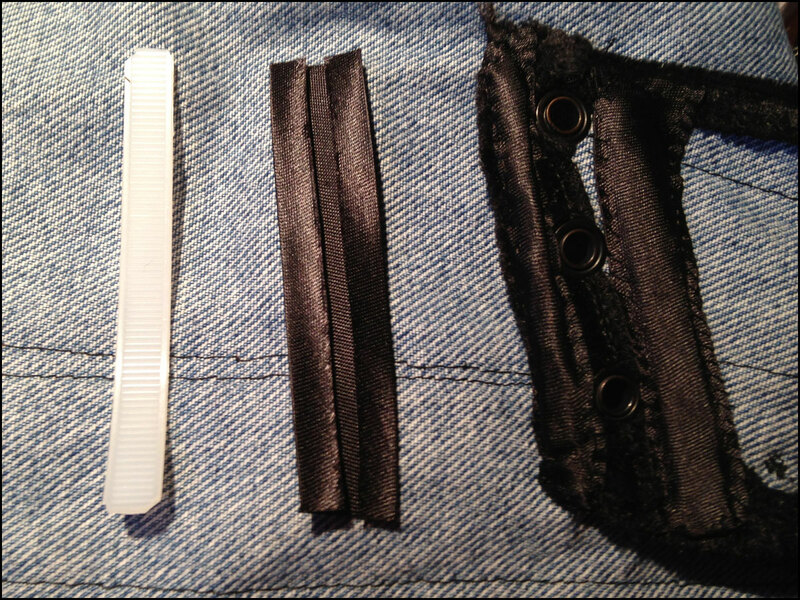 Sew the bias tape vertically, leaving the top open and enough room for the cable tie to slide in snuggly. Make sure you add one bone on each edge, two bones in the middle if you’re using a heavy decoration piece, and, if you’re using lacing with grommets, one bone on each side of them. You’re probably going to be better off sewing the bone channels before adding the grommets (use a loose one for measuring when choosing placement for the channels), and you might probably want to have the bones off while you try to make the holes with your awl. Around now you should be pretty much done with the base belt, and should have your shape, with some decoration (or not) but with the fashion fabric firmly in place. 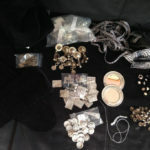 Now move onto the lacing, if using it: decide on number of grommets, mark them on the fabric, and use your awl to create a hole for each of the grommets. Keep in mind that you’re not aiming to CUT the fabric as to find a weak point in between the fibres that can be expanded. 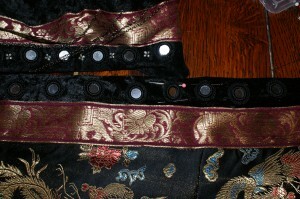 For location and number of the grommets, I would suggest to keep the numbers low enough that the manipulation doesn’t weaken the fabric, but high enough to make sure both top and bottom edges are tied, otherwise your lacing will gap a bit when tightening (experience talking here, I wish I’d used more). Use either the little die that came with the grommets and a hammer, or a hand-held fitting tool to put them on. And of course if you do have a hand-press for them, you’re probably doing corsetry already and shouldn’t be reading this, because you’d know how to do it. Once your grommets are on, insert the bones, sew the ends of the casings, lace up and check the fit. It’s ok if there’s a bit of a gap in between the front and back if you’re using laces, the important bit is that it’s not too loose: the fit should be snug enough that it won’t start wiggling around and falling off your hips when you’re dancing. 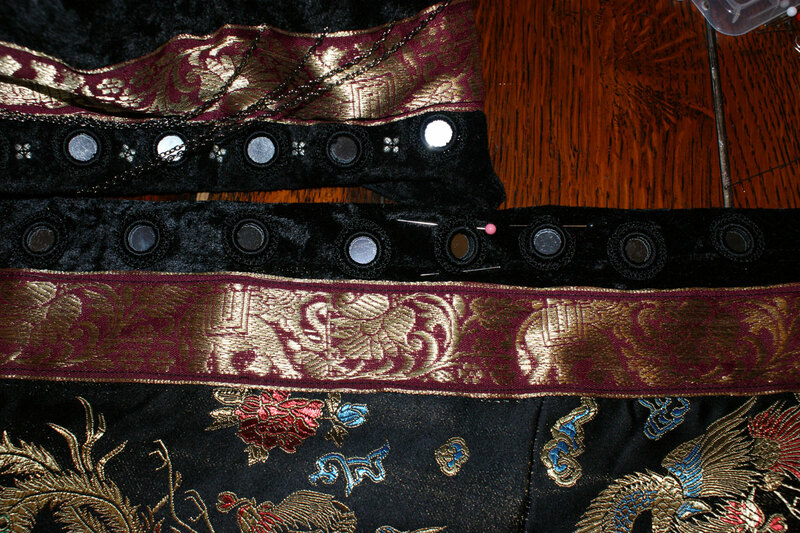 On the left is a picture of how mine look once boned and laced; notice there is no room for the eyelets to stretch the fabric. These bones will also stabilise the whole belt and prevent it from bunching downwards. Finally, it’s time to start (or continue) the decoration. If you’ve used a particular pattern or motif on the bra that you want to reproduce, pick it up, and try to make it as similar as you can, to get a unified look. 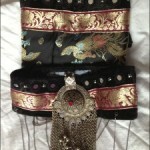 I used shisha mirrors and silver jewellery findings along the top, which I had to sew by hand. Remember when sewing these that you will be going through quite a few layers of rather sturdy fabric, so use your thimble, if you value your fingertips and nails. 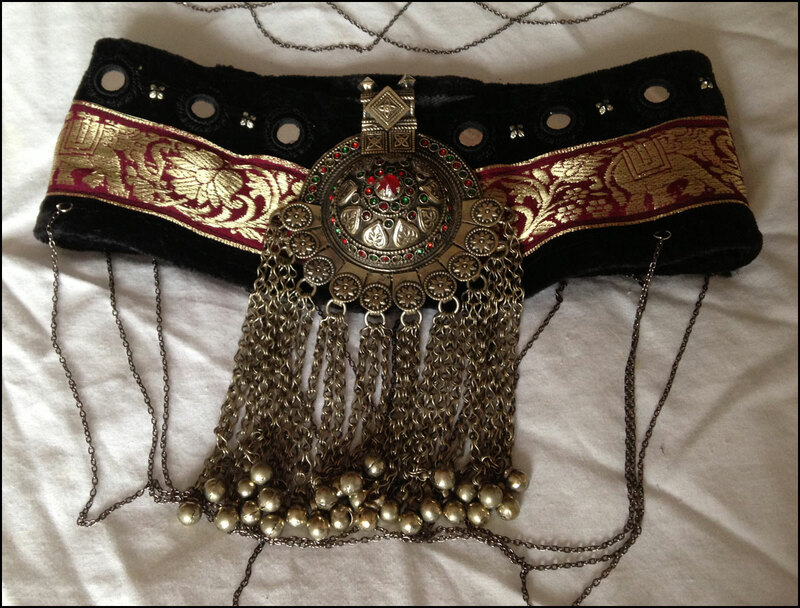 I finished the look with a big Kuchi pendant and some thin chains wrapping around the whole belt. Try it on, have a good wiggle, make sure that there are no leftover pins, whatever dangling pieces you’ve used are not too heavy for the belt or too thick or out of alignment, etc. Once you’re completely satisfied, cut pieces of the lining using your original sturdy fabric pattern, serge all around to prevent fraying, and sew by hand at the back. Make absolutely, positively certain that the fabric is NOT slippery; you want your belt to be glued to your hips, and any taffeta, silk or satin-like material will instead make it slide more easily. Needless to say, you do not want that, regardless of how nice it looks. 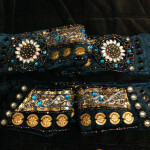 Put it on, have a good dance around, and enjoy your brand new, hand made, one of a kind belt!